How to perform a more recent installation of Iperf than the one included in Ubuntu / Debian / Mint ? 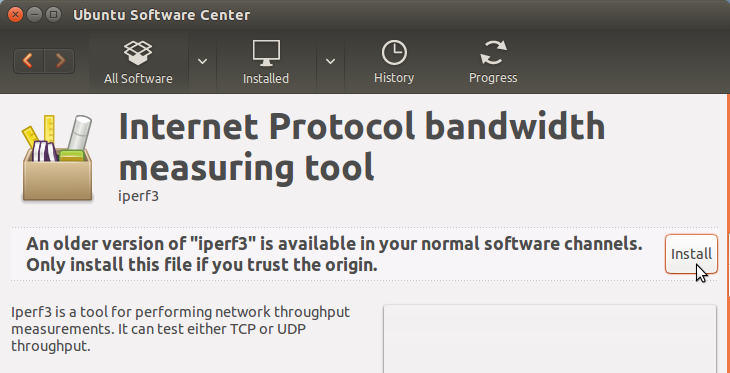 Note that iPerf3 is not backwards compatible with iPerf2. => How to perform a more recent installation of Iperf than the one included in Ubuntu / Debian / Mint ? iPerf license : iPerf is released under a three-clause BSD license. Log for iPerf3 : display "date,ip,localport,remoteport,duration,protocol,num_streams,cookie,sent,sent_mbps,rcvd,rcvd_mbps,totalsent,totalreceived"
MAJOR version when making incompatible API changes. MINOR version when adding functionality in a backwards-compatible manner. PATCH version when making backwards-compatible bug fixes. Source of Universal Windows Platform apps iPerf3, for Windows 10 Desktop & Windows 10 Mobile. UWP iPerf3 is developed by Tommy Zhang / Microsoft. UWP iPerf3 license : UWP iPerf3 is released under a three-clause BSD license. Packages are manually installed via the dpkg command (Debian Package Management System). dpkg is the backend to commands like apt-get and aptitude, which in turn are the backend for GUI install apps like the Software Center and Synaptic. 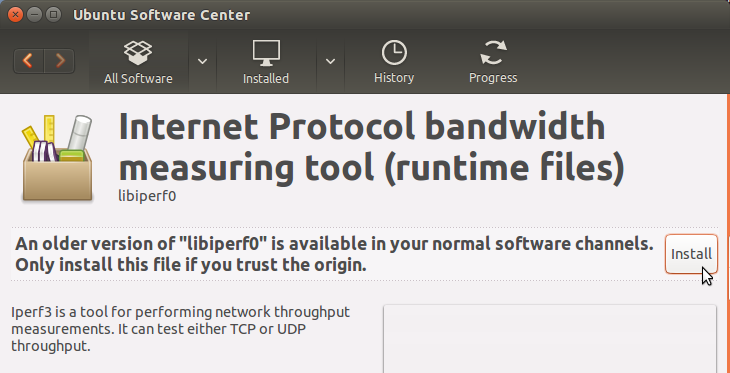 Remove the old version installed of iperf3 with "Ubuntu Software Center" or "Synaptic".